You might notice a few extra gamers hanging around your local Best Buy -- Dell has announced it will sell the Alienware Aurora exclusively through 200 Besy Buy locations as well as the store's website. People are defining themselves by the products they choose and the groups they associate with -- Alienware Aurora lovers are saying "I am a serious gamer and user who demands the best in personal computing." Designed for the serious gaming crowd, the Aurora has an AMD Phenom X4 9550 quad-core CPU, dual ATI Radeon HD 4850 GPUs, a 500GB3 7,200RPM hard drive and 4GB of DDR2 memory. 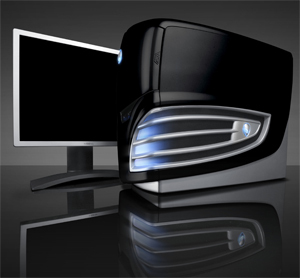 Other features include a multiformat DVD±RW/CD-RW drive, Alien Ice 3.0 cooling and Windows Vista Home Premium. Price: $1,699.99 (without monitor, mouse and keyboard). Let&apos;s See How Crazy Black Friday Gets This Year! People are defining themselves by the products they choose and the groups they associate with -- Alienware Aurora lovers are saying \"I am a serious gamer and user who demands the best in personal computing.\"
Price: \$1,699.99 (without monitor, mouse and keyboard).